Happy May the Fourth! It’s Star Wars Day! Hooray! I’ve always been a Star Wars fan, so I love uniting with all the geeks out there on May 4th! 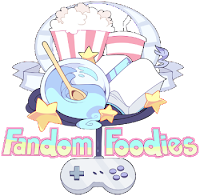 Appropriately enough, the Fandom Foodies theme for this month is Star Wars, hosted by Brittney at My Main is a Cook – with the cleverly coined hashtag #MaytheFork! 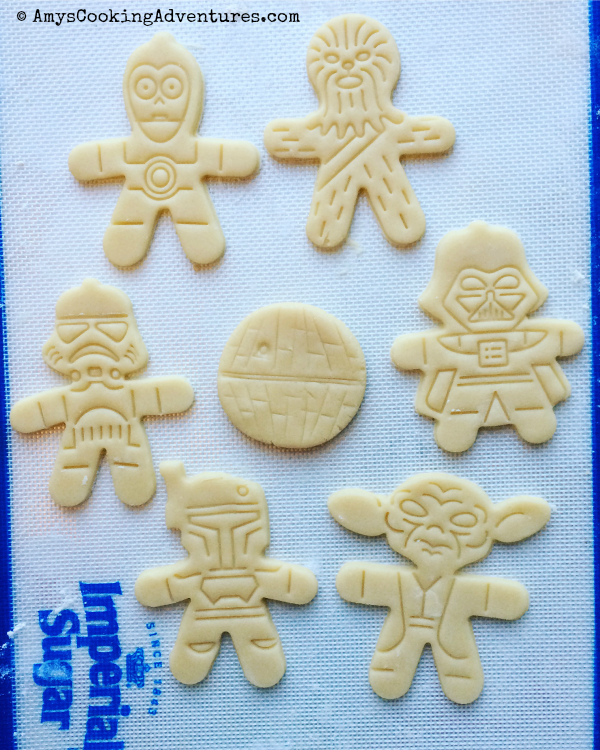 I’ve hosted Star Wars Parties in the past with various themed recipes, but I knew that I wanted to tackle cookies (again) this time around. I used a version of my mom’s sugar cookie recipe (below). 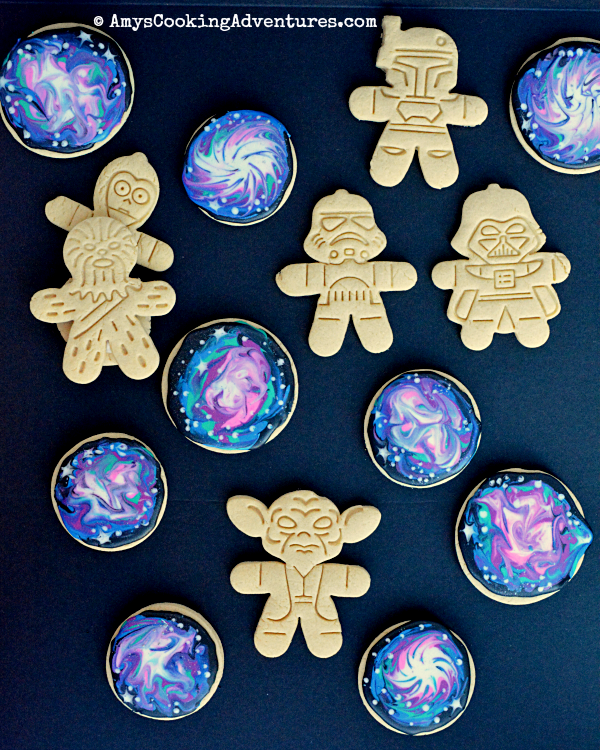 I used this amazing video tutorial from Sweet Ambs to make these stunning galaxies and nebulas (aren’t they perfect with the Star Wars character cut outs?) I made a few slight changes from the video – I added a little teal to the color profile, plus, I sprinkled the still-wet cookies with some silver luster dust to add a bit of sparkle! 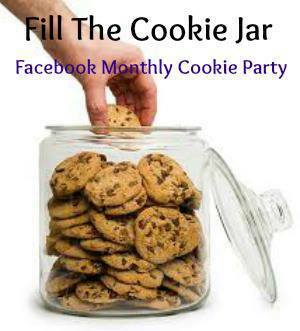 And since May 4th lands on the first Thursday of the month, I’m also jumping in the Fill the Cookie Jar fun! Don’t miss the great recipes from the other participants! -For cookies that will hold their shape and not spread, you can omit the baking soda (or just add ¼ tsp), but the cookies will be very firm. -For chewier cookies that puff and spread a bit, add the full 1 teaspoon. Place the butters and sugar into the bowl of a stand mixer. Beat on medium speed until light and fluffy. Beat in the eggs one at a time, making sure that each egg is completely blended before adding the second. Stir in the salt and vanilla. Slowly add in the flour and baking soda. Once the flour is mixed in completely, the dough can be rolled and cut into cookies immediately or can be refrigerated overnight for later use. Once cut to desired shapes, bake at 350 for 8-10 minutes (12-14 minutes for darker cookies). Remove from baking sheet and immediately and cool completely before decorating. Place the butters and sugar into the bowl of a stand mixer. Beat on medium speed until light and fluffy.Beat in the eggs one at a time, making sure that each egg is completely blended before adding the second. Stir in the salt and vanilla.Slowly add in the flour and baking soda. Once the flour is mixed in completely, the dough can be rolled and cut into cookies immediately or can be refrigerated overnight for later use.Once cut to desired shapes, bake at 350 for 8-10 minutes (12-14 minutes for darker cookies). Remove from baking sheet and immediately and cool completely before decorating. They are stunning and perfect for both themes. Thanks for sharing your Mom's recipe. This is a great cookie for the kids this summer. I know they will even like helping, love having the kids in the kitchen. Amy, these are so cute. I would almost hate to eat them. I bet any Star Wars fans would love them! Love your cookies...and a great recipe for both themes.